Helsinki, 23.5.2018, Mediaset, the leading commercial broadcaster in Italy, launched their hybrid, broadcast and broadband services (HbbTV) services in 2017 with the help of Icareus. Icareus delivered new HbbTV Carousel solutions to Mediaset, that was rigorously tested to support the simulcast of the legacy MHP platform and HbbTV, the critical requirement in Italy. Icareus solution will allow them to expand their HbbTV services. 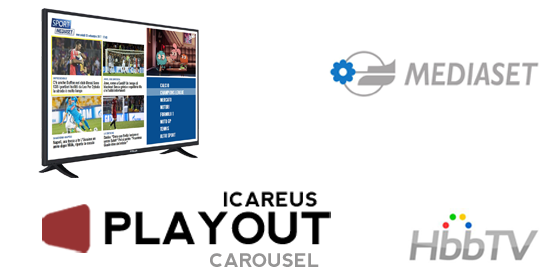 Icareus Playout CS Carousel server won the tender process arranged by Mediaset, due to the Icareus Carousel platform’s versatile features, the competitive costs and long history in broadcast production use. In addition Mediaset is long time Icareus customer and has experience of using Icareus Carousel server in their lab environment already since 2014, when it was delivered by Icareus partner Thomson Video Networks. Icareus HbbTV Carousel server allows Mediset to offer interactive HbbTV (www.hbbtv.org) experience to its viewers while managing the services and network parameters in the most efficient way possible. The Icareus Playout system provides Mediaset the most flexible and modular platform for hybrid HbbTV services. The delivery includes the solution for Mediaset’s terrestrial network and to Mediaset’s lab, allowing Mediaset to test and develop HbbTV services. Icareus’ Director Mr Mikko Karppinen says that “Mediaset is one of the best know commercial broadcasters in the whole Europe and it has also been one of the pioneers in interactive TV services during the 21st century. We are proud that Icareus Playout CS solution matches the high criteria of Mediaset and feel honoured and more than happy to deliver our HbbTV platform and to continue to innovate with them”. Icareus’ experienced broadcasting TV system partner Syes (System Engineering Solutions) is responsible of the integration, installation and delivery of the Icareus Playout CS HbbTV Carousel solution to Mediset. Syes (System Engineering Solutions) designs, manufactures and commissions TV broadcasting systems.